Girls Aloud are undoubtedly one of the most glamorous girl bands around, but if you thought their six hours in the make-up chair look was unobtainable for us mere mortals, then think again. 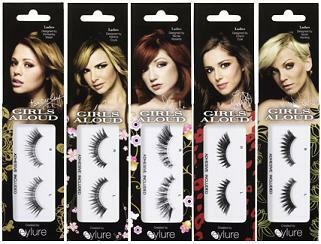 In association with Eyelure, Girls Aloud are just about to launch their own range of false lashes. False lashes are becoming more and more popular as a cheap, more effective alternative to expensive miracle promising mascaras. they’re great for creating dramatic looks for nights out and trying something different without having to buy loads of products. Each member of the band has designed their own set – some are extra long, some full and thick, and some Swarovski crystals also feature. They cost £5 each and should appear in Superdrug stores nationwide soon!